He studied BSc Business Information Technology at LSBU before completing MSc Internet and Database Systems. He is now working as Senior Big Data Project Manager at iResearch, a leading market research firm focusing on the Chinese internet industry. 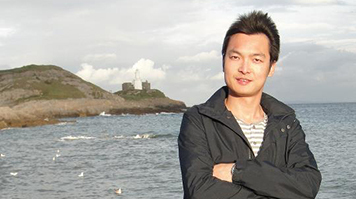 During his degrees, Linfeng got the opportunity to go on several placements. "My first placement was at London Globe Times. The role was Marketing Data Analyst. I learnt lots with regards to the business process, data analysis methodologies and using tools from the placement." Another placement was at an investment company based in London, where he was responsible for marketing data analysis. The placements gave Linfeng practical experience in professional environments, something that was to prove advantageous for him when applying for jobs after graduating. Linfeng is quick to pay tribute to the role LSBU played in his successes after graduating. "At LSBU I learnt very useful units such as Data Mining, Database Systems, Web Tech and Advanced Networking & Database. These practical units helped me to quickly enter the business environment and understand business processes. Professors gave us lots of hand-outs with up-to-date scenarios for case studies. This was so we could learn practical knowledge about real world business application combining theory knowledge. For me, the swiftest way to learn theory is by doing exercises and this way I mastered the it more easily." After graduating, he quickly secured a position as E-Commerce and E-Marketing Manager at MH Star UK, working in the role for a year before being promoted to UK Regional Managing Director. He stayed there until 2013, when he moved to iResearch. "The company I am currently working for is an Internet and Data Analysis consulting company. I am responsible for a big data product portfolio, defining market segments. I work with engineering to define, deliver and deploy quality, well defined time-bound product release. "In order to have a head-start in the job market after graduating, Linfeng advises students to read through various articles and tutorials to gain in-depth knowledge of the course and to begin using practical business analysis tools such as SPSS and Advanced Excel.